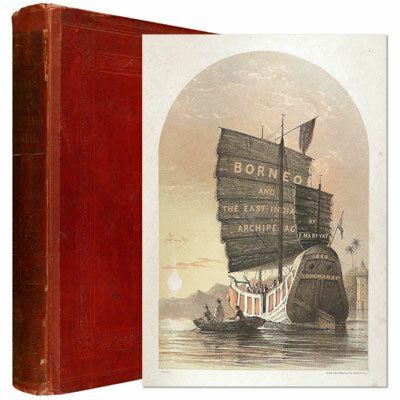 Borneo and the Indian Archipelago. With Drawings of Costume and Scenery - Frank S. Marryat 1848 - Longman, London - First Edition	A superbly illustrated work on Indonesia, and Rajah Brooke, with additional detail on Singapore, Macau, Hong Kong, and the Philippines. Frank Marryat served as a Midshipman on board the H.M.S. Samarang on a surveying expedition to the Indian Archipelago, 1843-1846, cut short in consequence, as Mr. Marryat infers, of the ill-conditioned behaviour and unpopularity of her captain, Sir Edward Belcher. Hill  notes that ‘interesting information is given in this book on Singapore, Macao, and the Philippines’. No provenance indicated, but early hand-written Short Index bound in at rear and pencil notes, are intriguing. References: Abbey Travel 549. Howes M229. Hill, Pacific Voyages, 1088. Quarto. (28 x 19 cm) pp. viii 232 [2 inserted hand-written ‘Short Index’]. Bound with half title.